Trick or Treat in many areas in Meigs County took place last week, with kids of all ages dressing in costumes as they collected candy and other treats from local residents and businesses. The Daily Sentinel will be running photos submitted from around the area in this week’s print editions and online at mydailysentinel.com. Here, Landen Woods dresses as a newspaper delivery person for Racine’s Trick or Treat. https://www.mydailysentinel.com/wp-content/uploads/sites/14/2018/10/web1_10.30-Trick-or-Treat-1_ne20181029154455883.jpgTrick or Treat in many areas in Meigs County took place last week, with kids of all ages dressing in costumes as they collected candy and other treats from local residents and businesses. The Daily Sentinel will be running photos submitted from around the area in this week’s print editions and online at mydailysentinel.com. 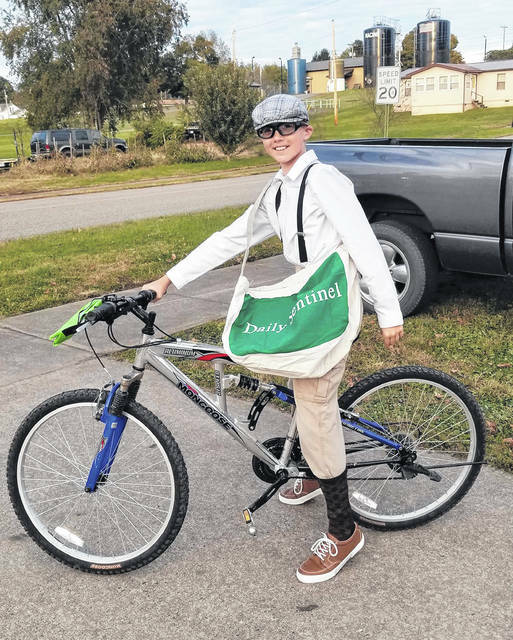 Here, Landen Woods dresses as a newspaper delivery person for Racine’s Trick or Treat.